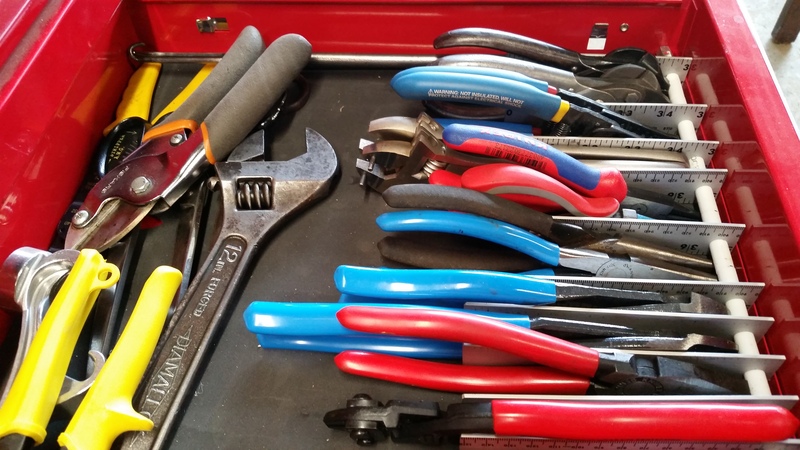 Back in 2013, I came up with an idea for a simple, inexpensive aluminum pliers rack for toolboxes and posted it on GarageJournal.com. At the time of this entry, I see that my post has had over 83,000 views. I think a big part of the appeal of my design is that you can build a full length rack for a drawer for under $20, and it’s a sturdy, all-metal design that will last for decades. There’s no plastic to break. It’s infinitely adjustable to your custom needs. Plus, you can build it with minimal tools. Below, I’ll show you how! 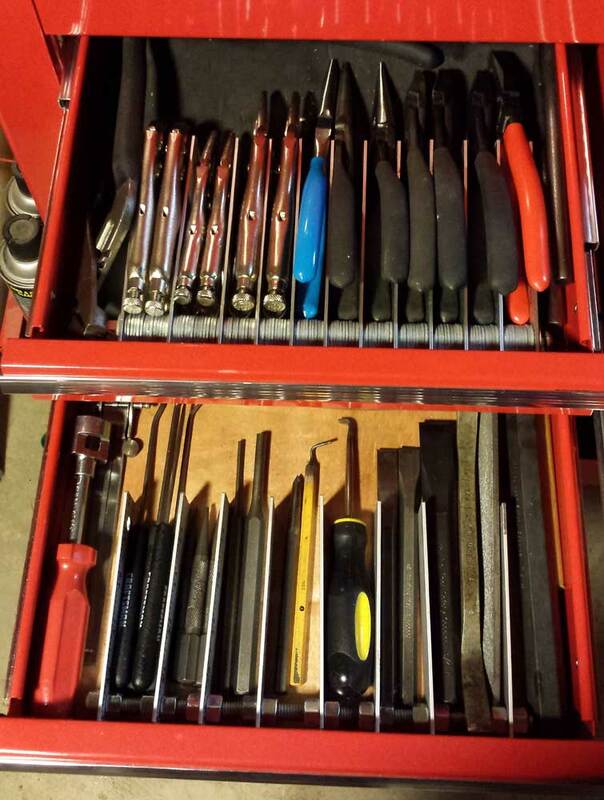 Larger tools would fit the rack just fine, but my drawer height is too shallow, so I stow them to the rear. By the way, when you’re finished reading through, consider tossing five bucks in my PayPal tip jar if you’re so inclined! No pressure. (Ok, maybe a little pressure – lol). But seriously, a few bucks really helps me keep this place going. Needless to say, know your tools and skill level, and only tackle this at your own risk and discretion. Metal can be sharp and drills can hurt you. 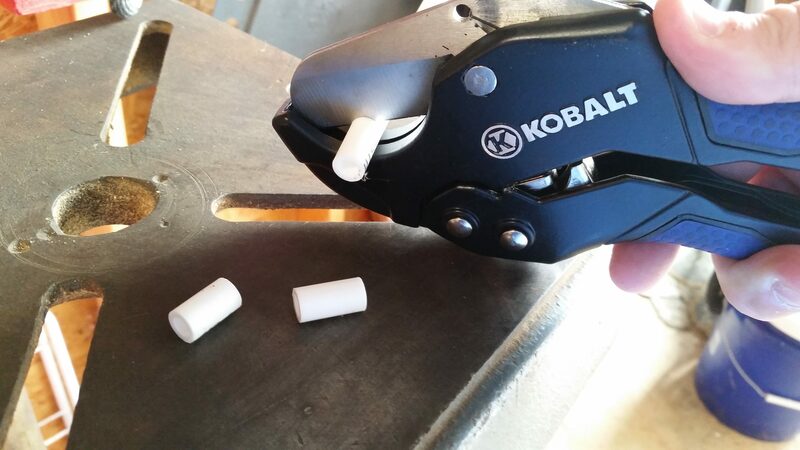 Always use safety glasses and proper ear protection when using a rotary tool. You might prefer to go up 1/32″ or so for clearance, but don’t use a drill larger than the PEX outer diameter. Determine the desired width for the rack as well as how long you want your dividers to be. 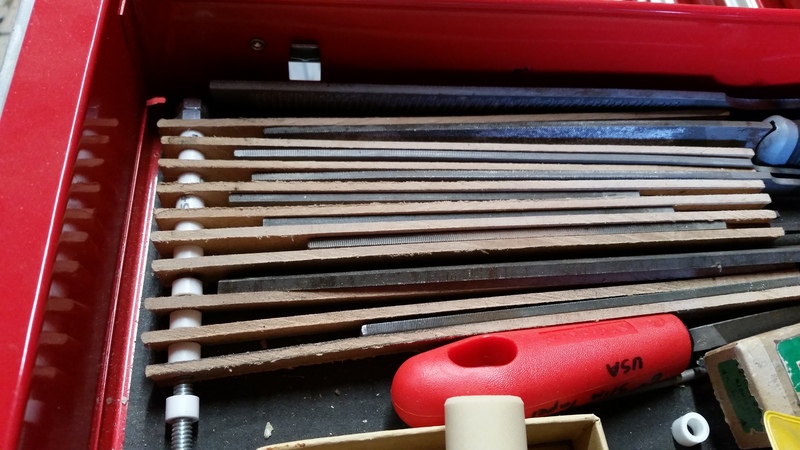 I recommend 4″ to 6″ long dividers, depending on the size of your pliers. Include about 1/2″ extra length to accommodate the rod. Thread a few nuts on the threaded rod, then cut the rod to length with a hacksaw. After cutting it, unthread the nuts, using them to clean up the cut threads. Cut the dividers out of the ruler using the hacksaw. File or sand the cut surfaces to deburr them. This is where using a ruler as stock is convenient: you don’t need to measure and mark it before cutting. However, a piece of aluminum bar stock would work fine. Gang several dividers together, up to 5 or 6, and tape them securely. Measure inwards about 3/8″ in from the bottom side and 3/8″ in from one end, then punch the center of where you plan to drill. With the work in a vise, drill a 1/4″ hole through the dividers to accommodate the threaded rod. You may prefer a slightly larger drill bit for clearance, but you don’t want the rod to have too much wiggle room. Repeat with remaining dividers. If you keep all the holes lined up, you’ll achieve the best results. A drill press will probably do a cleaner job than a hand drill, but either will work. 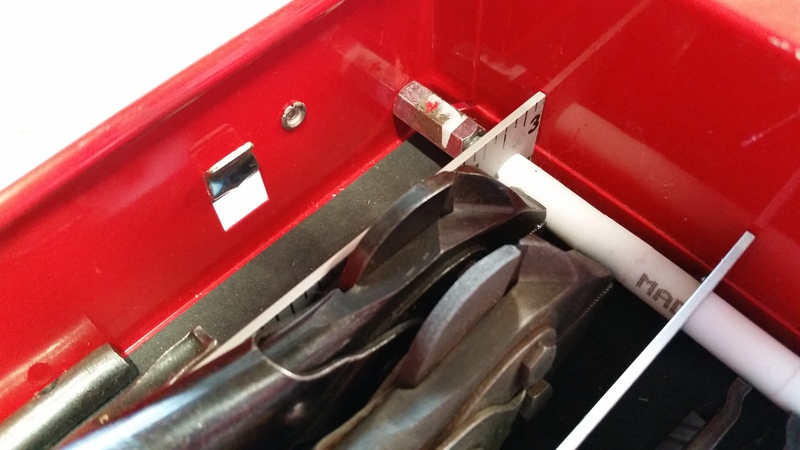 Using the PVC cutter, cut out sections of PEX pipe that are wide enough to space out the dividers to fit your tools. Try and keep the cuts squared off. You can have wide or narrow segments – it’s completely up to you. Thread a nut on one end of the rod, then begin stacking alternating pieces: divider-PEX-divider-PEX…etc. until you have assembled your pliers rack. Finish with a divider, and then thread on another nut on the end. Tighten down the nuts at either end to keep the rack stiff. 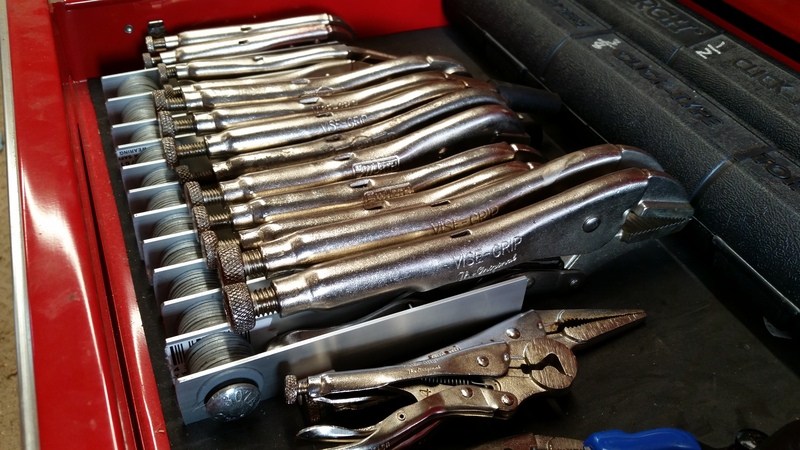 If you cut the thread close to the full width of your drawer, you can use coupler nuts on either end to press against the drawer sides, helping to hold the rack in place. Coupler nut used to resist the rack sliding. 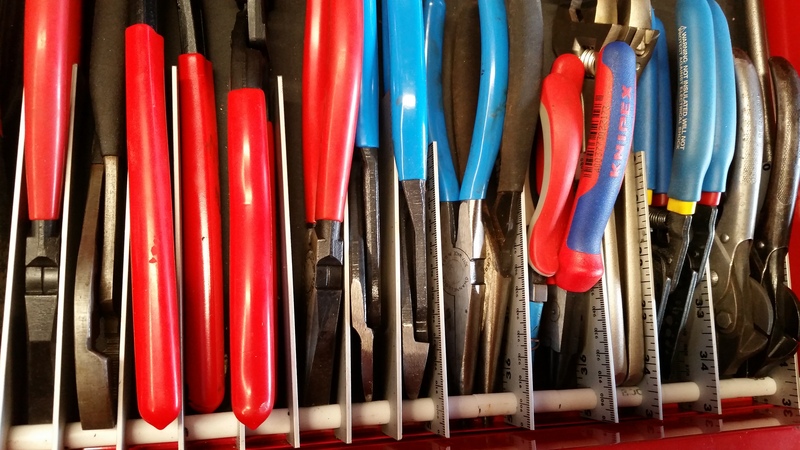 If you are storing delicate tools, or tools you don’t want rubbing on metal, such as files, you can replace the aluminum rulers with strips of 1/8″ masonite or hardboard (a whole sheet can be bought for about $11). If you don’t have PEX pipe or a cutter, you can use a bunch of small washers to separate the dividers, but the cost can add up. You can also simply use nuts on either side of the dividers to separate them, but that’s a lot of threading. For smaller racks, you can use a long bolt instead of threaded rod, but again, it’s not optimal. But it’s an option! There’s all kinds of possible variations on this theme, but I think you’ll find that my design is a lot better than all the nonsense people often go through with adapting dish racks from the dollar store, or paying out the nose for flimsy plastic racks that don’t accommodate all their tools. The racks I’ve designed are all metal, built to last, inexpensive, and not too difficult to make at home with minimal tools. I hope you’ll make a few for your box, and I hope very much that you found this project information useful! Thanks for visiting! Be sure to check out all my other posts and leave a comment below if you end up building your own rack!